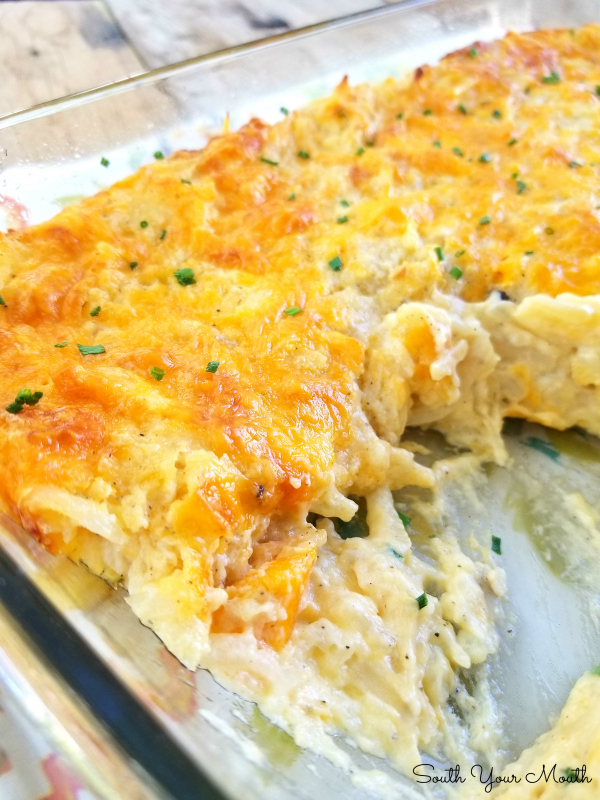 A creamy, cheesy hashbrown casserole recipe made with French onion dip instead of sour cream that’s even better than Cracker Barrel’s! A few years ago I decided to make a big Christmas dinner for some friends of ours who’d had a rough couple of months to try to make things easier for them during the holidays. Side note: if you’re ever looking for a way to help someone out at Christmas, cooking a meal is a great idea because receiving food never feels like taking a hand-out which can be hard for hardworking, proud folks. I made the typical Southern Christmas dinner of baked ham, macaroni and cheese, sweet potato casserole, etc. and was looking for one more casserole-type dish that I could make because they’re just so easy to travel with and reheat. I decided I wanted to make a hashbrown casserole and realized I’d never actually made one before! 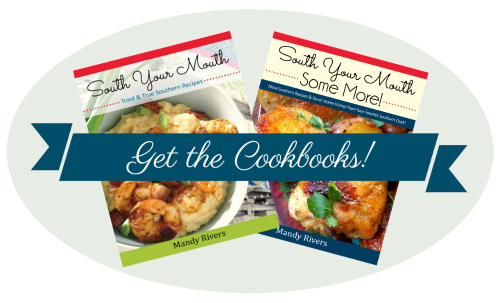 Which seems odd since it just seems like something everybody ought to know how to make! 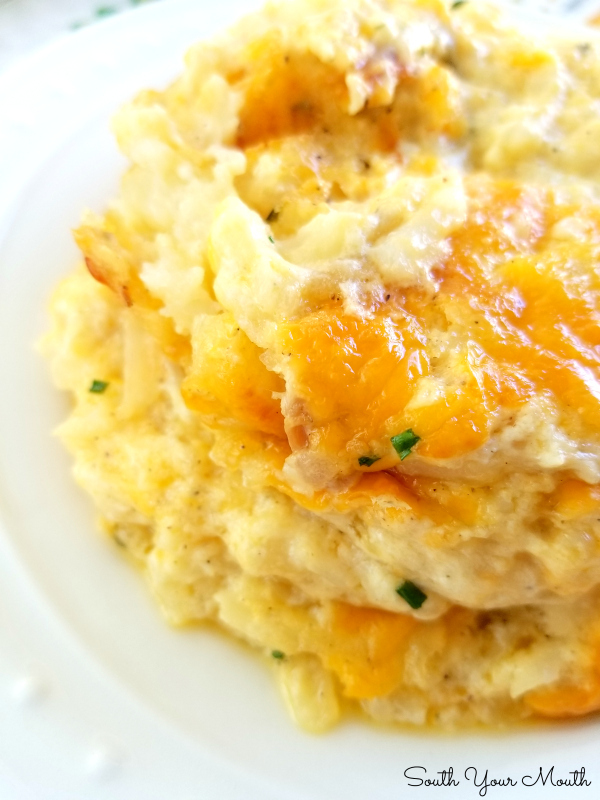 I looked through a few cookbooks and on some of my favorite recipe blogs to learn the basics: frozen hashbrowns, cream of something soup, sour cream and cheese. Some recipes called for onion and some didn’t. I wanted to add onions to mine but I knew not everyone likes them so I had an idea… I decided to use cream of onion soup (which wasn’t rocket science) but I also decided to use French onion dip instead of sour cream! 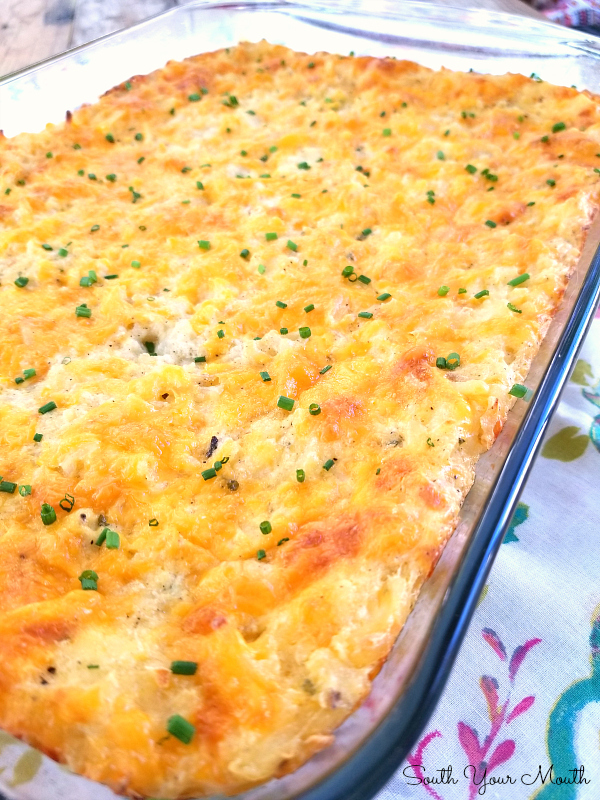 The French onion dip is my secret weapon for a more flavorful casserole! French onion dip is just sour cream, onions, herbs and spices which is so much more flavorful than plain sour cream! I pretty-much doubled everything I made that day to keep half for our own Christmas dinner and was pretty excited to try the hashbrown casserole since I’d never made one before. And we loved it! 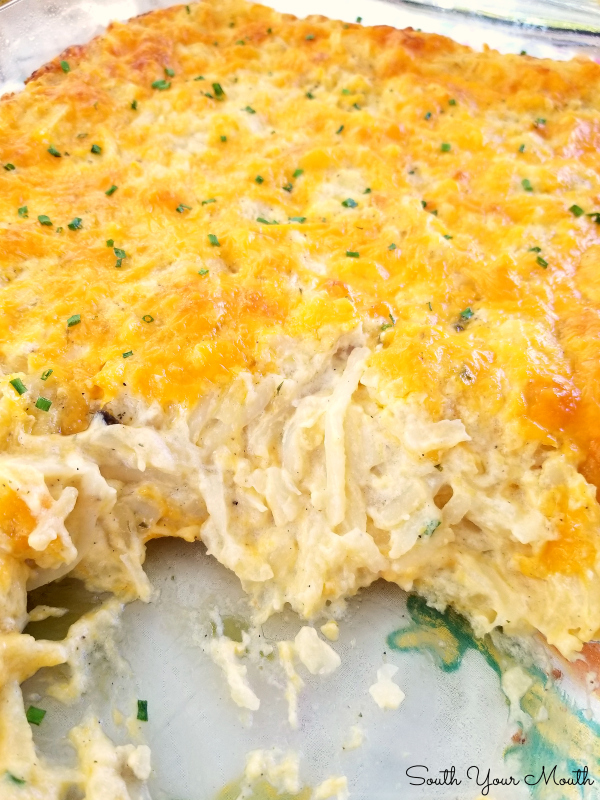 It’s very much like the Cracker Barrel hashbrown casserole but without the diced onion. 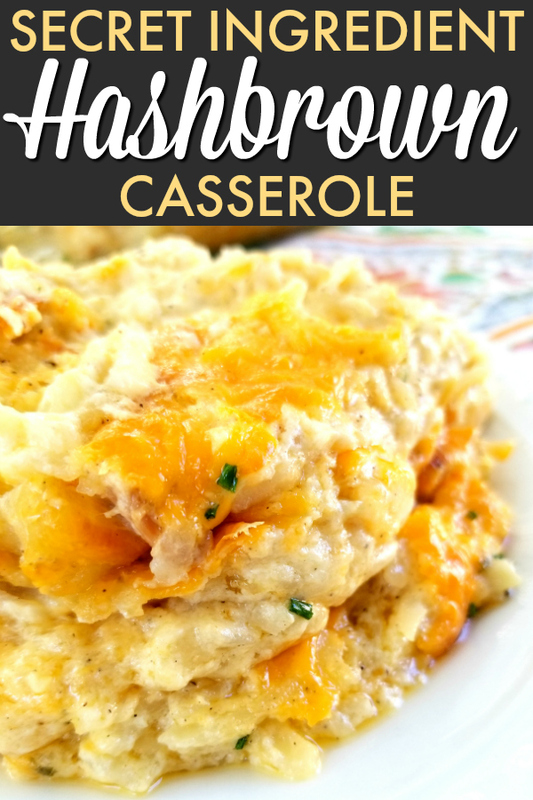 It’s super creamy and cheesy and has the best combination of flavors! I’ll mention this in the recipe instructions below but I want to share with you a tip I’ve learned making this over the years since that first time. 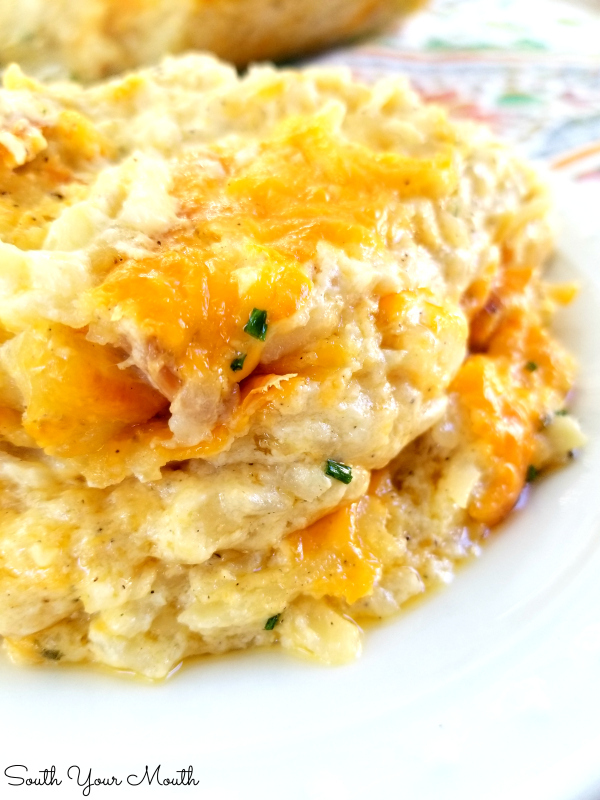 You want to defrost the frozen hashbrown potatoes just enough that the shreds loosen up and can be stirred into the other ingredients but not so much that they become too mushy. And to illustrate that, you can see that I didn’t do that in this batch because the potatoes didn’t hold their shape enough! I set out to cook this for y’all then remembered an appointment I had forgotten about and had to throw everything in the fridge and leave! I didn’t get to make this until the next day and by then the hashbrowns had set in the fridge and gotten somewhat mushy. So, this will be one of those do as I say, not as I do recipes! It tastes the same – and is still delicious! – but the texture isn’t as good. Allow hashbrowns to defrost just long enough to loosen the shreds so that the potatoes can be stirred into the other ingredients. When I’ve let them completely defrost they tend to break up too much when stirred (such as in the pictures above!). 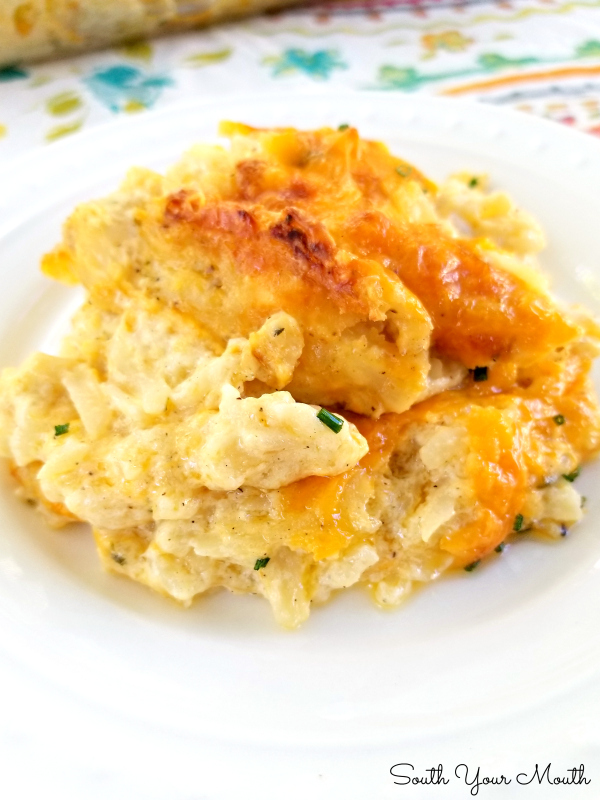 Shred cheese then set aside about one cup to top the casserole with before baking. Preheat oven to 350 degrees. Combine cream of onion soup, French onion dip, salt, garlic powder and pepper in a large mixing bowl then stir well. Add cheese (reserving 1 cup for later) and potatoes then gently fold to combine. Spoon mixture into a greased 13x9 casserole dish then top with remaining cheese. Drizzle melted butter over cheese then bake at 350 degrees for 50-55 minutes or until golden brown and bubbly around the edges. Enjoy! You can substitute sour cream for the French onion dip if needed (maybe consider adding a little extra seasoning if so). Substitute cream of cheddar or cream of chicken soup if desired. Do you think this will work if I leave out the cheese? Why would you want to leave out the cheese.....?? would like to make this ahead for easter. do you think this would freeze well? I tend to not like potato dishes after they've been frozen but since this starts with frozen hashbrowns I don't see why not! Sounds yummy, I'll have to give it a try! What a genius idea! I'll bet that adds great flavor. I can't wait to try it! I made these yesterday for an early Easter dinner and they were delicious!!! Made this yesterday for Easter dinner and it was a huge hit! Delicious!